New White Paper Analyzes a Common Dilemma Facing Print Providers – Which Type of Software to Invest In? New study sponsored by PressWise from SmartSoft discusses the priority of web storefronts versus workflow efficiency. 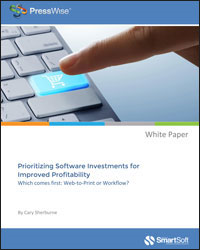 A new white paper, written by renowned author and print industry commentator Cary Sherburne, takes a look at the questions faced by many print service providers making the decision to invest in software. Most printing companies understand the need to invest in various types of software as they continue to evolve their business models and infrastructure to better address current market realities. Building a customer-facing web portal that allows customers to do business online is a key component in today’s marketplace, but as customers increasingly demand more shorter run jobs and faster turnaround times, printers need to operate more efficiently. This means eliminating as many touches from their workflow as possible to process these orders profitably, which is where workflow technologies such as automation tools and print MIS come into play. But how should these investments be prioritized? Is a web-to-print storefront the first step? Should you work on the back end first? Or perhaps there is a way to address both at once? The paper, entitled ‘Prioritizing Software Investments for Improved Profitability: Which Comes First, Web-to-Print or Workflow?’, was sponsored by PressWise from SmartSoft. It explores the pros and cons of various approaches and provides actionable ideas about how businesses might choose to proceed when making software investment decisions. It also includes real-world stories from three different types of print service providers who have successfully made and implemented these types of investment decisions, with very positive results. One of these print providers is Midstates Group, a $50 million company based in South Dakota. There is no registration required to read the entire white paper, which is available at http://www.presswise.com/white-papers. 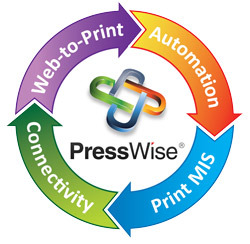 PressWise is an end-to-end Web to Print, MIS, and Print Workflow Automation solution that comes complete with robust features such as web ordering, unlimited templates, estimating, quoting, order processing, workflow management, complete shipping integration, fulfillment, and the ability to integrate with most third party web storefronts (including PTI, Pressero, PrintNow, PixFizz, PageDNA, RedTie, Prisme, and more) and existing back-end accounting systems. For more information, visit http://www.presswise.com. SmartSoft provides desktop and enterprise-level workflow solutions for print management, postal address correction, and postal discounts. Their products include the AccuMail® suite of address hygiene software, the all-in-one mailing software solution, SmartAddresser 5™, the IM barcode mail tracking service MailSpotter, and the end-to-end print workflow solution, PressWise. SmartSoft is a privately held company with offices in Agoura Hills, Santa Barbara, Philadelphia, and Montreal. Visit http://www.smartsoftusa.com for more information.